Recent discoveries point to tantalizing possibilities. But to understand the possibilities, we have to do one important thing: Stop thinking that life as we know it – that which depends on oxygen – is the only kind of life. 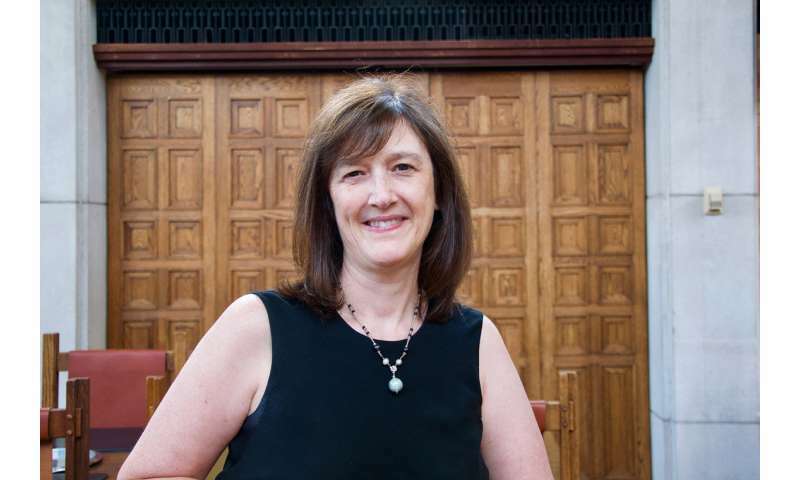 "If there's one thing we've learned from this planet of ours, it's that it's very easy to fall into paradigms and assume that what we know is in fact the limit," says the University of Toronto's Barbara Sherwood Lollar. "Sometimes we define what we go looking for by what we already know and, oddly enough, we can actually miss things entirely." Sherwood Lollar is a University Professor of geology and Canada Research Chair in Isotopes of the Earth and Environment. She was also the chair of the committee that recently published "An Astrobiology Science Strategy for the Search for Life in the Universe." It is a year-in-the-making report, commissioned by NASA, to recommend an approach to finding life beyond Earth in a planned, strategic and open-minded manner. "Our work was to survey the landscape, identify discoveries and recommend areas of new direction," says Sherwood Lollar. The report is part of a "grassroots process" that leads into the National Academies of Science, Engineering and Medicine's decadal surveys, where science communities map out what should be focused on over the next decade. The committee's overarching approach is to use the fascinating discipline of astrobiology – the study of the origin, evolution, distribution and nature of life in the universe. "With a definition like that," says Sherwood Lollar, "astrobiology is immensely interdisciplinary. To search for life beyond Earth, we need to try to understand the life and death of planets and their star systems, such as the influence of the sun on our solar system. And to do that, you need heliophysics, astronomy, astrophysics, biology, microbiology and geology, as well as advanced engineering and technology. And we will need to be able to interpret huge amounts of data, which is where machine learning and artificial intelligence will be essential." With all of these possibilities still to explore, Sherwood Lollar and the committee have recommended that the search for life take a variety of forms of life into consideration. "We need to go broad in thinking about the search for life in the universe. There might be oxygen in a planet's atmosphere, but that assumes life will be like life on Earth, resulting from photosynthesis. But life can survive through other metabolic strategies." She points out that life on Earth has been dependent on oxygen only for the past 2.5 billion of the planet's 4.5 billion years. Before that, "we had lots of life, but no free oxygen in the atmosphere. And that's important to realize – planets evolve. At one point, Mars was probably more habitable than Earth. We need to look at that evolution with other planets." So the goal in going broad in the search is to "keep the blinkers off and consider the huge variety of lines of evidence that might be important to really nail down the question." Another important direction for future research is to explore what is going on beneath the surface of planets. Part of the excitement around the discovery of the ocean deep under the surface of Europa, a moon orbiting Jupiter, is that life underground has been discovered on Earth, too. "One of the reasons I wanted to be a scientist was the discovery on the ocean floors in the 1970s that life down there was not driven by the sun's energy," says Sherwood Lollar. "It was not photosynthetic life, but life dependent on chemicals. "Hydrothermal vents mixed with ocean waters to produce chemical energy and it was discovered that microbes in those systems can live in the deep parts of this planet off of that chemical energy. And it could then sustain higher order organisms like tubeworms. And it's since been found that life that lives on chemicals is not just on the ocean floors, but also the continental subsurface." And if these forms of life – odd to us, but still life – can happen in Earth's subsurface, could they happen in the deep parts of other planets? In July, researchers found what they believe to be a lake under the southern polar ice cap of Mars. Water is a key component of the life we know. "This really qualifies as a body of water. A lake, not some kind of meltwater filling some space between rock and ice, as happens in certain glaciers on Earth," Roberto Orosei of the Italian National Institute for Astrophysics told the BBC. The discovery of thousands of exoplanets – planets outside our solar system – by the NASA Kepler spacecraft increased the possibility for life elsewhere, especially those exoplanets at the special distance from their star in a habitable zone (that is, an area that has the right conditions for life). Planets in our solar system have moons; now astronomers are theorizing that exoplanets must also have moons, thus increasing the possibility for life. While the report pushes exploring via an outside-the-box focus, Sherwood Lollar also emphasizes that "the committee is not recommending that space scientists and agencies do everything." In fact, she says, it is essential to strategize and to plan carefully and to ensure that governments, research institutions and agencies work closely together on how to conduct the search for life. "It's a very human report in that sense. It's about teamwork. It isn't a solitary, ivory tower kind of exercise. Scientists have to be deeply engaged in their own communities and with the broader public. That's how we do our best work in any area of research." But how important is this search for life elsewhere? Wouldn't the high expenditures associated with space research be better spent on the problems more directly associated with life on Earth? "It's an excellent question and one I ask myself. So I say this: Astrobiology is about the study of life in the universe, which means it is about life on Earth. We need to take a broad view of the scientific enterprise and recognize that the search for life off Earth can have important ramifications for what we do to keep this planet habitable. Life will persist for us. The question is what will the quality of that life be? "So if you care about this planet, there are aspects of astrobiology that are deeply integrated in the health of Earth. It's not an either-or proposition. It's about broad-scale thinking about how planetary systems are linked. And that becomes more vital by the day with climate change on this planet." Even though humans are destroying the environment and killing off most life on the planet (60% since 1970!!) the earth will continue on supporting life. What we'll accomplish is removing humans from the equation. We'll all die off like the dinosaurs and something new will arise as the dominant species. Life carries on, stupid and destructive humans won't. Human life on this planet is a wonderful thing to experience but we're to self-centered to care what we're doing to our world over the long run. We're doomed, I have no doubt. If we are doomed it's because the intelligent individuals who understand the conditions we find ourselves in, like yourself, give up and say "well its too hard to educate 7+ billion people" we might as well give up. Stop hating humanity as if it has failed some designed test, or like we have some kind of moral obligation to treat our planet nicely and survive. There is no test and we don't. Due to our natural evolution we find ourselves in the unique position of holding the reigns of development on our planet. We will either continue into the future or we will create conditions we can not survive in. That is that, and that has been true for hundreds of thousands of years since humans began to adjust the planet, and it will be true for as long as we exist. Do your best to keep a calm positive head and do your best to help create a future were we can live. That's all anyone can really do. Turing, when arraigned before the court for mass-murder. "Well, you see it was like this. I was positive that my existence is more valuable than all those other people." "They were consuming my air supply! I told them that I had first priority but they wouldn't listen It was only fair and righteous for me to kill them to convenience myself." Still projecting, are you, williejoe? You seem disturbed and bothered over what appears to be your prediction that Turing will be turning into a malefic villain to take up the occupation of mass-murder for self-gratification. How and where do you get such ugly thoughts into your brain, williejoe? Was your early childhood so fraught with horror, fear and mayhem that you would have a strong desire later in your life to project your own fears onto a totally innocent stranger on a science website? Think it over, williejoe. You owe TuringTest an apology for being so crass. There is only one test, and that's if we wake up tomorrow and there's kids. "....can live in the deep parts of this planet off of that chemical energy." Canadians should double their efforts to speak proper English. "off of" indicates a poor educational upbringing - especially for a scientist who should know better. But I do agree that there are life forms on and underneath the surfaces of other planets, but that not all are microscopic. Many planets are home to life forms that are similar in size and shape to animals on Earth - some even malevolent and dangerous. The probability that NASA, ESA and other space agencies - if they discover life on other planets that are bigger than a bacterium, for example - or even bigger than an ant - that they will provide the public with detailed evidence of such life, may not happen. I KNOW that NASA and other agencies jealously guard and stand watch over the information that they have acquired, and will acquire in the future. In some instances, it is done in the name of "national security". Wow, nothing like a little paranoid psychosis to spice up a thread, hunh? You really should get your paranoia over seeing kids when you wake up checked out ASAP, DS. seu, you are the one I wouldn't sell ammunition to! Whatever made you think that I would be shopping for ammunition; and why would you think that I would want to buy it from YOU - if I were shopping for it? But perhaps DaSchnippo would be interested in buying your ammunition, williejoe. First you accuse someone of mass murder - and then you say you don't want to sell ammunition to me. Wow williejoe - just Wow. hey lady, take the blinkers off yourself and understand what Fermi asked many many years ago: "So where is everybody?" This comment is really, really outdated. We've only put a scratch a few microns deep in the surface of the universe and Anonym thinks we've been there done that. Wow. The first thing they'll want to do is collect a specimen .. kill it and pickle it and ship if back home to the Frankenstein Laboratory. Humanity's depravity isn't satisfied with observation of living things .. it has to collect dead things like butterflies until there are none left, and then try to figure out how the dead had lived. Monstrosity is what mankind is. The scientist is to be commended for taking the naturalistic paradigm to its logical conclusion and letting others think about their own expectations of life. On the other hand she also makes the basic and fundamental error in assuming that LIFE as we know it can arise all by itself via random chemical and physical processes without any intelligent and powerful outside help. It is quite easy to show just impossible this is for life on earth. To name but a few obstacles - chirality, coding and decoding, signalling, self-replication and repair - all of which rely on information. It is impossible to construct abstract entities (information) from purely materialistic processes. How did the information get into the system of life? Even if the biological arrangement can be attained by some miracle, the life process itself needs to be kick-started off in the right order or else it's just DEAD. Non-believers have to have blind faith w.r.t. biological life. @Coffespin: re: "where is everybody?" -> "This comment is really, really outdated"
Really? Does that mean it is not valid anymore? As far as things stand today - nothing has changed since that statement was made to invalidate it. So the egg is really on your own face.